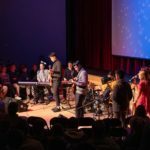 The Fall Athletics Awards Ceremony was held in McEvoy Theater at New Hampton School on Thursday, November 29, to celebrate the official end of the fall athletic season. Our coaches and Director of Athletics Jamie Arsenault provided highlights and honored several team members. Thank you to all of our student-athletes for a great season of perseverance and sportsmanship, and congratulations to the students below that were recognized for their exceptional contributions of leadership and athleticism. Photographs from the evening’s festivities are available on Flickr. Student-athletes were honored at the 2018 Fall Athletics Awards in November. Visit the calendar to see the winter athletic schedule and join us for a game to cheer on our Huskies! View the Livestream or photos of Fall Sports Awards. This award was established in 1980 in memory of the late Donald Tottingham, a fine athlete, outstanding English teacher, and Cross Country Coach, who died in a tragic automobile accident following Commencement in 1979. Tottingham, an avid runner who trained for and competed in numerous marathons and road races, was an inspiration to many. 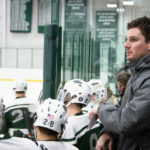 His example influenced the lives of both students and faculty members during his three years at New Hampton School. Each year, this award recognizes that Cross Country runner whose discipline and determination commemorates Tottingham’s spirit. ’07 and Emma Berry ’10–all of whom took their foundation as student-athletes from New Hampton School to the collegiate level. 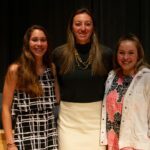 The recipient of this award is the student-athlete who humbly demonstrates a conscientious commitment to the betterment of the field hockey team. This young woman is the teammate who others most rely upon to advance and support the team on the field through skill, sportsmanship, and school pride. This student-athlete also carries these qualities off the field and into the classroom and campus life. two sons, Van and Dan (NHS ’65), were freshmen. His family established the Scott McLeod Football Award to honor his memory. McLeod, an outstanding sportsman and athlete, received Sports Illustrated’s Silver Anniversary All-American award in recognition of his achievements both as a collegiate football player at Grinnell College (IA) and in his professional life. This award recognizes that football player who exhibits his qualities of outstanding spirit, courage, and sportsmanship. Established in 1991, this award honors the memory of the late Richard Sterndale, former teacher and head football coach at New Hampton School from 1965 to 1968. Following two operations for brain tumors, Sterndale and his wife Joan returned to New Hampton. 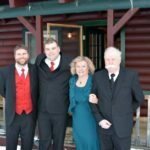 During the 1989 season, members of the football team, who made regular visits to help out at the Sterndale home, dedicated their championship season to the former coach. The Sterndale Award recognizes that football player whose contribution to the New Hampton football team began as an underclassman. This player has developed his skills and showed dedication and courage beyond the call of duty. In 1959, two outstanding soccer players, Christian Parlanti and Thomas Moss, combined their talents to lead New Hampton School’s Varsity Soccer team, coached by David Rice, to an undefeated season. 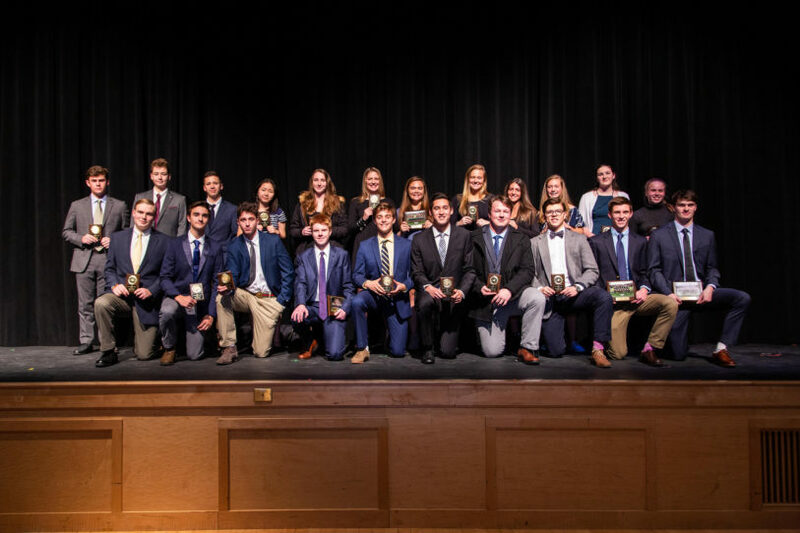 Later as alumni, they created the Parlanti- Moss Soccer Award to immortalize that historic season and to recognize that soccer player who best exemplifies the combination of talent, drive, determination, and team spirit of that victorious team. Peter Gulick and his wife Ruth — whose daughters Phoebe ’80 and Robin ’82 played for the New Hampton School’s Varsity Women’s Soccer Team — were early supporters of New Hampton’s women’s athletic program. They established this award to recognize both the Women’s Soccer Team and particularly, the contributions of an outstanding female soccer player each season. The Field Hockey Coaches’ Award is named in honor of longtime Head Coach Bekka Joslin, 2007-2017. Competitive, talented, and steadfast, Coach Joslin was an exceptional leader and mentor to athletes in the field hockey program. Her love of the sport and dedication to her teams are what this award’s recipients exemplify in turn.